How much is your family glued to technology? Is this habit harming your health? 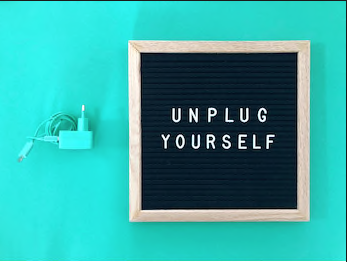 How can you unplug more often? Like a healthy diet, the key is to make sure your family's media use is well-balanced. Signs Your Family Is Too Plugged In! Your kids spend hours a day watching TV or movies, playing video games, or on the Internet. There are multiple TVs in the house, and they’re all usually on. Family members often ignore each other when tuned in to a digital device. You, your husband or kids would feel lost without your cellphones. When you aren’t using a specific media device, you’re thinking or talking about it. Sound familiar? Then a media diet will benefit your family. Scale back your media use and your family will become closer, you’ll save time, and you’ll probably sleep better, feel healthier, and even lose weight. One of the first things recommended to people working on losing weight is to track what you eat. In your diary, track the times of day and length of time you and your family spend on your digital devices to get a realistic picture of your media usage and/or consumption. After a week of logging in you and your family's usage, assess areas where you can utilize time together without devices. Like increasing more fruits and vegetables into your food diet, get more substance from less media time, pile on your own digital version of produce. Examples include creating a family video or slideshow, watching an educational TV show, or researching your family history. Plan TV time around the shows you and your family intend to watch. Or, record your shows to watch at a later scheduled time. Similar to this, designate a specific time to spend on your computer or other mobile devices to prevent being attached to your device for hours at a time. Similar to snacking without when bored, it's natural to continously flip through social media feeds, or channel surf. To avoid the the boredom, make sure your family has plent of other activities to do, such as baking, drawing, reading a book, playing sports, taking a walk or jog. Take a vacation from your electronics and visit outdoors spaces and places with natural beauty and recreational activities. Go to the park or beach, have a picnic, play games and have fun! Mini-breaks, like a cellphone-free or TV-free weekend, can also be beneficial in resetting your attention and priorities. Make it a "house rule" that all devices are put away at a specific time and/or in another room, to prevent insomnia or daytime fatigue. Get rid of distractions and teach your family how to be creative indoors and out. Play board games, ride a bike, paint, etc. to reduce time spent on electronics. Just like tracking weight progress daily, weekly or monthly, reflect back on you and your family's digital media and device usage, then adjust usage accordingly.